This Is How Visualizing Open Data Can Help Save Lives – Open Data Aha! Alexander Howard at the Huffington Post: “Cities are increasingly releasing data that they can use to make life better for their residents online — enabling journalists and researchers to better inform the public. Los Angeles, for example, has analyzed data about injuries and deaths on its streets and published it online. Now people can check its conclusions and understand why LA’s public department prioritizes certain intersections. The impact from these kinds of investments can lead directly to saving lives and preventing injuries. The work is part of a broader effort around the world to make cities safer. Like New York City, San Francisco and Portland, Oregon, Los Angeles has adopted Sweden’s “Vision Zero” program as part of its strategy for eliminating traffic deaths. California led the nation in bicycle deaths in 2014. 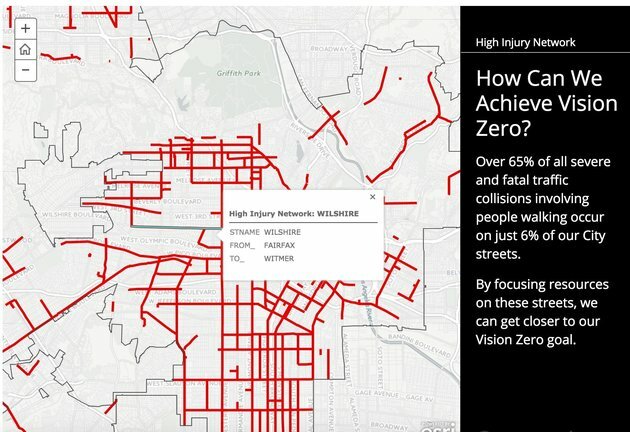 At visionzero.lacity.org, you can see that the City of Los Angeles is using data visualization to identify the locations of “high injury networks,” or the 6 percent of intersections that account for 65 percent of the severe injuries in the area. The work is the result of LA’s partnership with University of South California graduate students. As a result of these analyses, the Los Angeles Police Department has been cracking down on jaywalking near the University of Southern California. Abhi Nemani, the former chief data officer for LA, explained why the city needed to “go back to school” for help. “In resource-constrained environments — the environment most cities find themselves in these days — you often have to beg, borrow, and steal innovation; particularly so, when it comes to in-demand resources such as data science expertise,” he told the Huffington Post. The City of Los Angeles is now working with another member of its tech sector toeliminate traffic deaths. DataScience, based in Culver City, California, received $22 million dollars in funding in December to make predictive insights for customers.